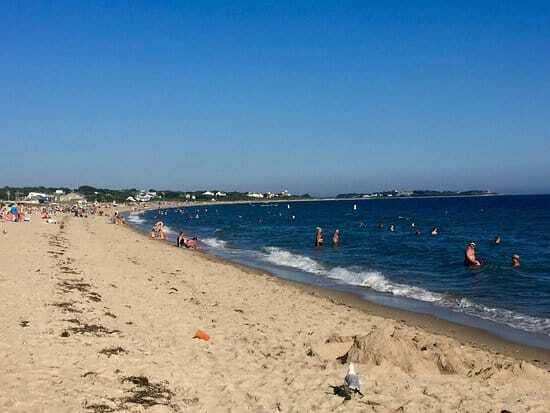 Two mile-long Revere Beach, north of Boston but easily accessible by T, looks east across the Atlantic Ocean and attracts as many as 100,000 visitors on warm summer days. Established in 1896, Revere Beach also has the distinction of being the oldest public beach in the United States. A public bathhouse, Victorian-style pavilions, and plenty of food vendors across the street add to the lively ambiance. Lifeguards are on duty from late June through Labor Day. If you enjoy crowds and occasional music from radios, Revere Beach can be a blast on the weekends. If you prefer to avoid big crowds, go early in the morning or after 6:00 in the evening, and avoid the weekends. You’ll have the beach to yourself except for a few dog walkers and photographers. Enjoy the spectacular views! For several days every July, the New England Sand Sculpting Festival brings visitors from all over the world to watch master sand sculptors turn their individual allotments of 10 tons of sand into elaborate although ephemeral pieces of art as they compete for thousands in prize money. For the best beach food, walk across the street to Kelly’s (410 Revere Beach Blvd, near Wonderland Station) for a lobster roll or clam plate. With a nice view of the city’s skyline, Carson Beach is an ideal place for city dwellers to take advantage of Boston’s geography. 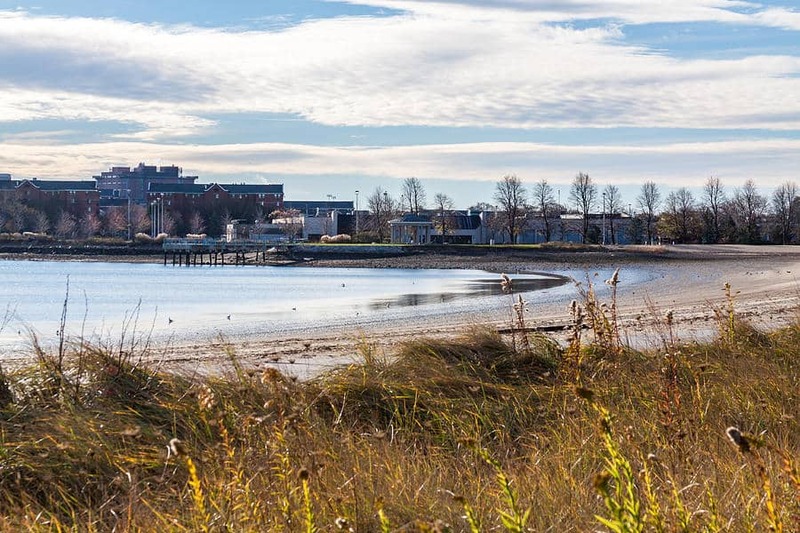 From Carson, you can take advantage of the HarborWalk to enjoy nice views of Dorchester Bay on a peaceful walk, run, or bike ride to the Kennedy Library. Easy to access and a solid option for families, Constitution Beach is a popular spot for kids with lifeguard-supervised swimming, a playground, and athletic courts. Sunbathers and swimmers can enjoy views of Boston Harbor and Logan Airport while the sheltered benches and open field provide space for picnics or a pick-up game of Frisbee. At first glance, the town beach in sleepy Menemsha doesn’t appear to be much, but when the lights start to go down over Martha’s Vineyard, that’s when the show begins. 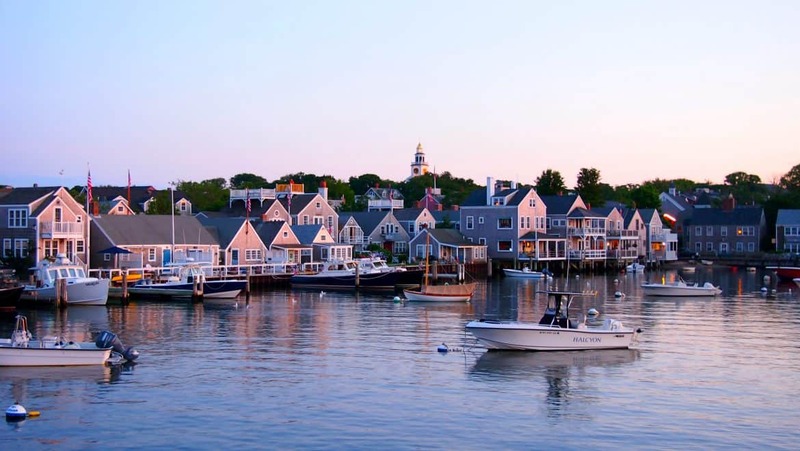 Grab fried clams at the nearby popular shack, The Bite, or steamed lobster from the likes of Menemsha Seafood or Larsen’s Fish Market and settle in for what many consider to be the best spot to watch a sunset in the entire state. The calmer waves at Menemsha Beach also make this a favorite spot for families with young children. For sure, Menemsha is a more serene, genteel alternative to the busier crowds on most other Vineyard beaches. The drive down Route 88 can be a headache on any given day, so do yourself a favor and reach this beach by way of Horseneck Road, which runs parallel. You’ll discover rolling farm lands, a winery, and a tranquil alternative to the sometimes maddening rush. 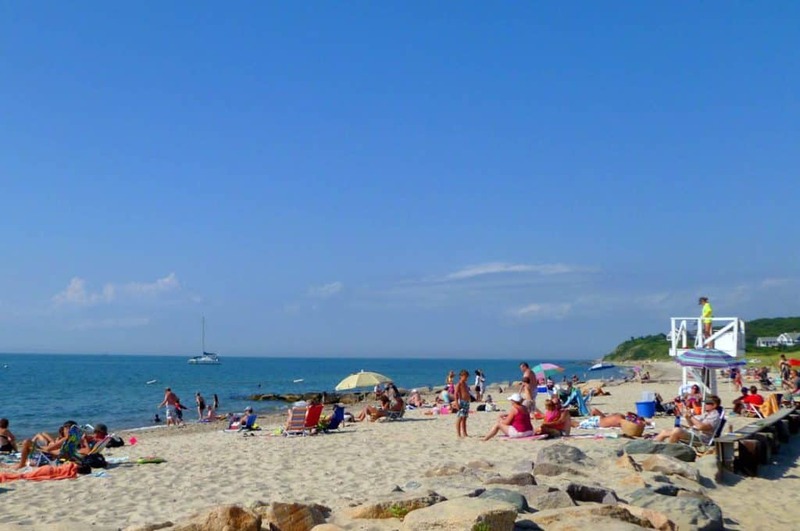 Once at Horseneck, you’ll find ample inexpensive parking ($8 for residents, $14 for non-residents), classic Massachusetts dunes, sparkling, clean sand, and new changing facilities. Birders will love the habitat situated here. Camping is also available nearby, featuring 100 sites. Ocean waves can be rough at times, and seaweed can be plentiful, but Horseneck is still a beautiful spot to spend a beach day. Whether you’re looking for a spot for your kids to splash around, or a place to walk your dog close to the city, Tenean Beach is a popular swimming beach for families, with playground facilities as well as tennis and basketball courts. The beach is in a protected cove off the Neponset River, making the water very calm and safe for beginners or learners. The fine, white sand at Katama Beach, also known as South Beach, plays well in contrast to the deep blue ocean crashing into it with some ferocity at the shore. The three-mile stretch of land stretches far to both left and right, creating a soothing atmosphere where no land is visible as far as the eye can see — a welcome escape. The waves can be a bit more aggressive, which makes it an ideal destination for boogie boarding or body surfing. Parking can be a real issue, as spaces at the beach are reserved for Manchester-by-the-Sea residents only. 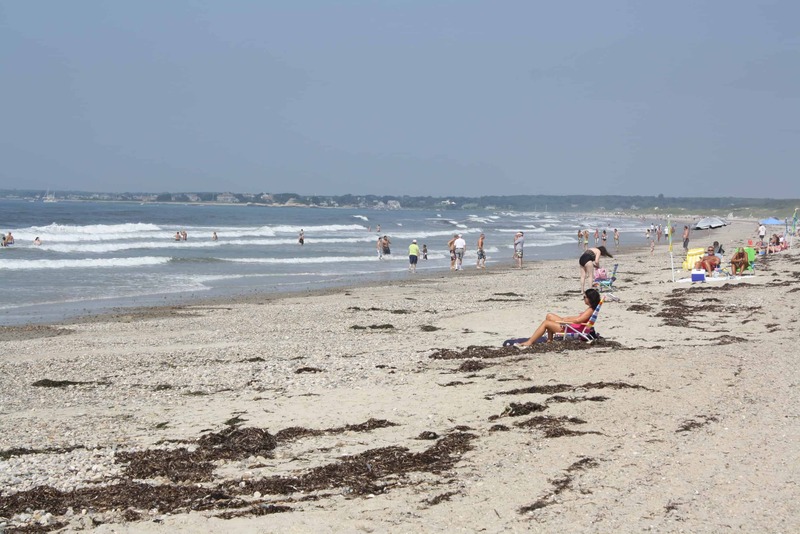 But you can find limited metered spots in the nearby downtown area if you beat the crowds, and Singing Beach still gets points for accessibility thanks to the presence of the MBTA commuter rail, just a short walk away. The rocky cliff coast of Singing comes into full view upon arrival, giving the area a feel almost like Maine. The pristine sand makes this a favorite North Shore destination, while the stunning views provide a soothing atmosphere. 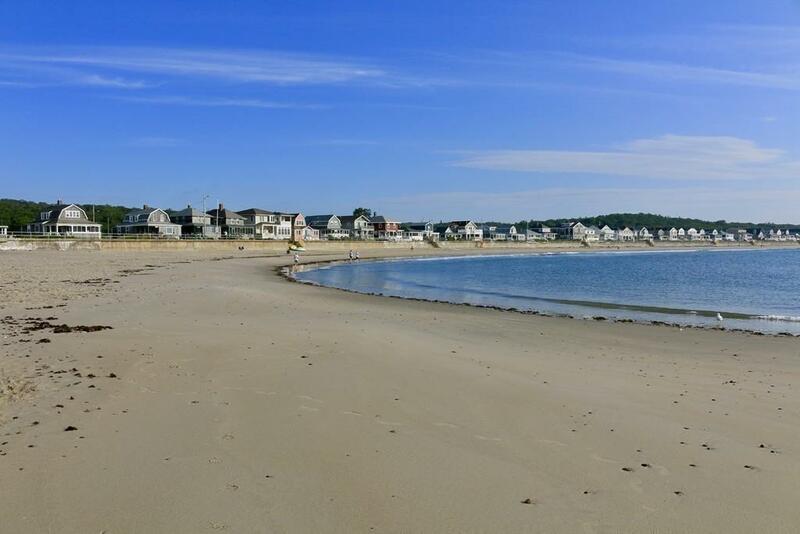 Stretching all the way down to Rockport, Long Beach is one of Gloucester’s most underrated attractions. Walk along the soft sand with the quaint houses lining the beach to get a view of the beautiful twin lighthouses, and cool off in the water when you get tired. Visitors say that the waves here are some of the best, so take your boogie board, or surf after the lifeguards leave. Keep in mind that there aren’t any facilities or snack bars on the beach, so visit a restroom before you go and bring a cooler for food. 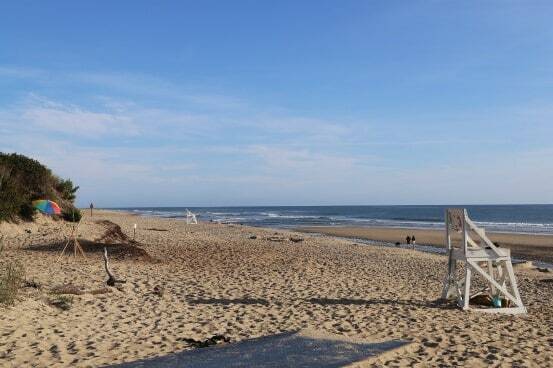 One of Cape Cod’s most popular beaches, Craigville gets crowded on summer days. 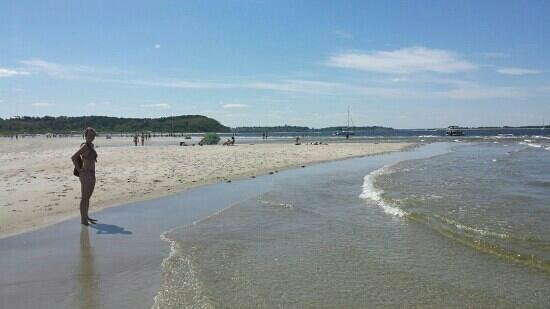 Long and wide, the soft sand area allows for a lot of sunbathers and swimmers. Craigville is also a favorite among teens and college students, but appeals to all ages with lifeguards and clam shacks. 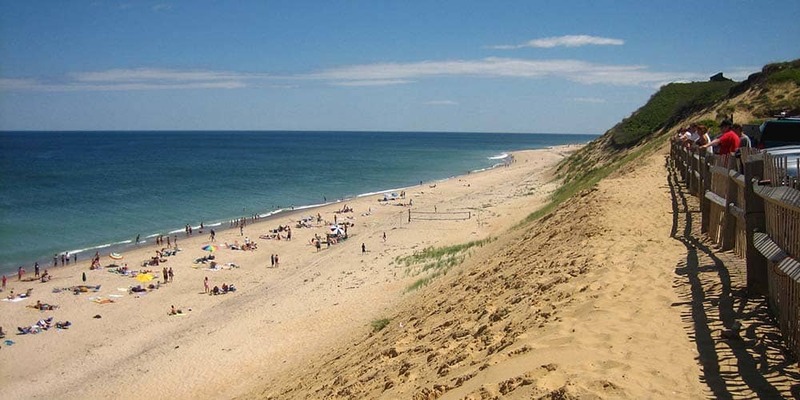 Stare out at the ocean from atop this Wellfleet classic’s sand cliffs for one of Cape Cod’s most breathtaking views. Then make your way – slowly – down the adjacent embankment and it will seem like the beach swallowed you into its beauty. The clay-colored cliffs consume you, as if you’ve been swallowed up by the surroundings. Be sure to stop for lunch at the Beachcomber atop the cliffs, a typical beachside bar. Tip: Park for the day in the Beachcomber lot for $20; you’ll receive a food or merchandise voucher for the same amount. If that’s full, look for additional parking down the road. As with most popular destinations, parking can be tight, so plan to get there early. This gorgeous stretch of land on the North Shore features fine powdery sand, clear ocean water, and some impressively clean changing and food facilities. 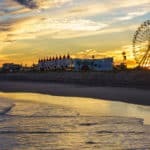 The short walk across the parking lot boardwalk to the beach provides beach goers with a variety of sights, from the plentiful mounds of sand dunes to the immaculate view of one of the state’s most beloved summer spots. Parking can be pricey – $25 on weekends – but spots are normally available if you get there early enough. 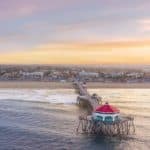 And since the beach stretches for miles, you’re not likely to have a difficult time landing a spot in the sand even on the most crowded summer days. If you want to leave the car behind, consider taking the Ipswich Essex Explorer, from the Ipswich commuter rail station. For just $5 round-trip, the shuttle transports passengers and drops them off right in front of the beach—even if the parking lot is full. The ticket price also covers beach admission. 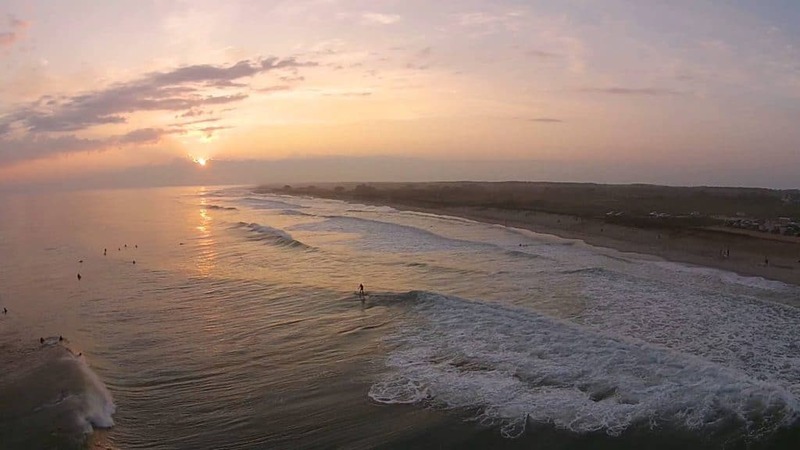 Located on the south shore of Nantucket, Cisco Beach is a surfing paradise, with waves just gnarly enough to provide the perfect atmosphere for both beginner and experienced boarders alike. This long stretch of sand is backed on one side by eroding dunes, the other by a cool ocean that boasts a number of wet suits at any time of day. Beginners can learn the craft from the Nantucket Surfing Co., which is on hand for lessons and rentals. No public transportation to Cisco, reachable only by personal vehicle or taxi. Fare from Nantucket town is generally around $14 for one person, one-way. Each additional person will run a few dollars more. Well known on the other island for sunsets is Madaket, located at Nantucket’s westernmost point. Sunsets are a seasonal treat here, but so too is an early-morning stroll on the quiet beach. The surf can be heavy, as evidenced by the amount of ocean debris on shore. And even though it’s easily reached by Nantucket public transportation, a $4 round-trip from Nantucket town, the remoteness can sometimes make you feel as though you know a secret kept from other islanders. The sand is a little whiter and brighter at the tip of the Cape, where Provincetown’s crown jewel provides the final stop on the historic Cape Cod National Seashore. The views of the Atlantic Ocean are sweeping, and this is a great spot to make an early destination for a spectacular summer sunrise. Waves tend to be light here on an average day, making it a fine spot for families and those not looking to tangle with seaweed. One of the first stops on the Cape Cod National Seashore, this Eastham favorite places annually on beach guru Dr. Stephen Leatherman’s list of the top 10 cleanest beaches in the country thanks to pristine ocean conditions, fine, powdery sand, and a concerted effort to protect the nesting piping plovers. Adjacent to the beach you’ll find miles of salt marshes, providing a dramatic backdrop to a Cape Cod jewel. Plentiful parking is available in the nearby parking lot ($15), from which a free National Seashore shuttle bus will whisk you to the shore. 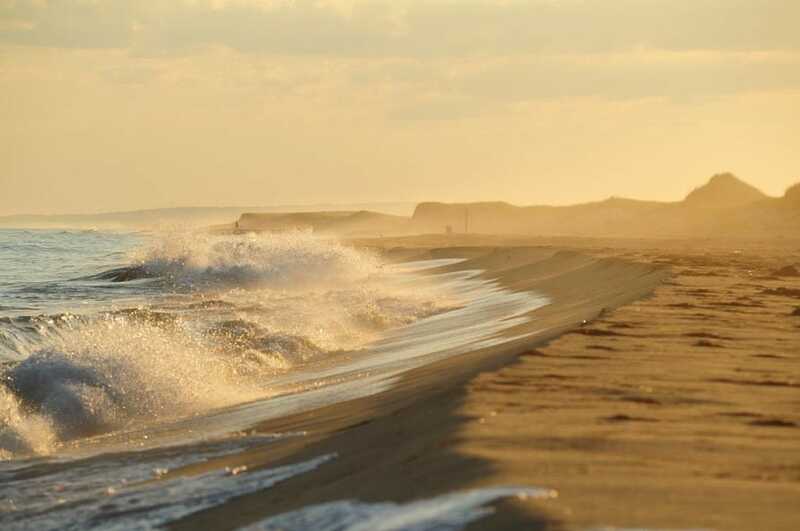 Passes for all National Seashore-run beaches are $45 for the season. Well, I must say your knowledge about beach destinations is superb. I didn’t know anyone else who is as knowledgeable as you when it come to beaches. I recommend your site to some of my friends also. I love beaches and it’s very awesome feeling relaxing at beach and listening to the soothing sound of waves. I have been to Race point beech though and couldn’t agree enough, you have mentioned everything in detail. Well done. It’s interesting to know that the Revere Beach attracts up to 100,000 visitors on warm summer days. I didn’t even know that the beach had been there for as far back as 1896. Being the oldest public beach in the United States and, of course, with the plenty of food vendors across the street, it’s cherished by a lot of people, known and talked about everywhere in the world. 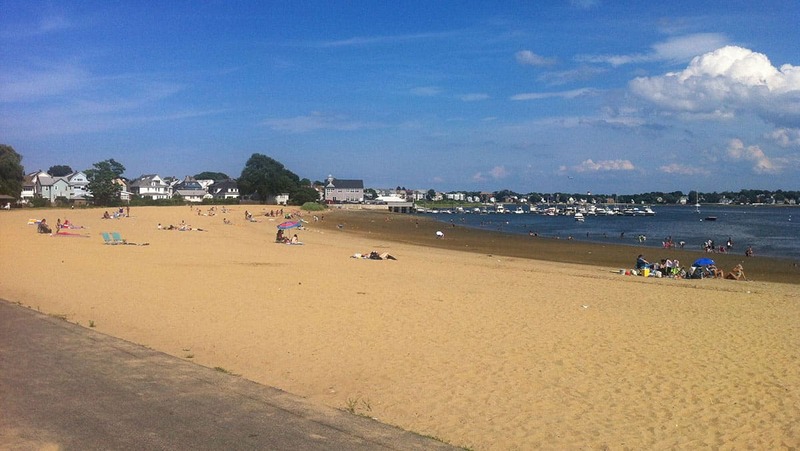 My grandmother use to take me to the beaches of Massachusetts when I was little. The single thing I remember is it was fun. And loving the sand. She lived in Revere a great memory. And loved reading about all the different places . That have beaches on the coast line. Maybe I should plan one up that way. Thank you for sharing the pictures and article were awesome. Glad you enjoyed Scarlett. Yes, you really should. Surprisingly, Massachusetts has some very beautiful beaches. Thanks for visiting the best Massachusetts beaches. Never think about beaches and Massachusetts in the same thoughts. 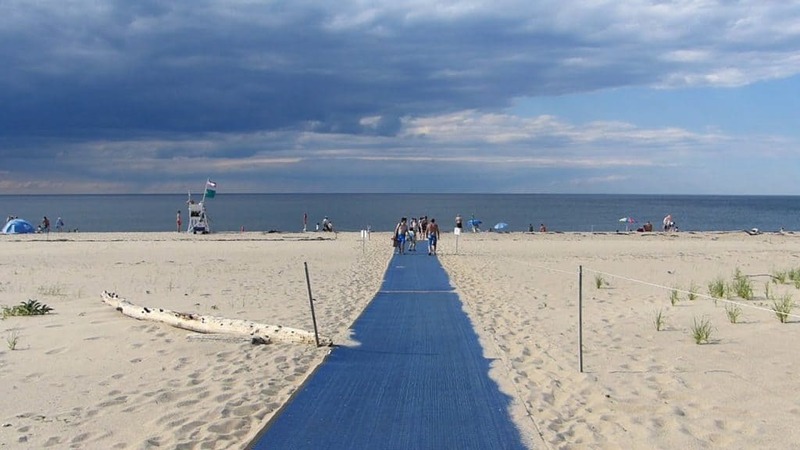 This is one area that is on my list for travel in the future, now I have to look at going to the beach when I go there. Thanks for lining up a great selection of beaches to choose from. I know the season is shorter in this area, what is the best time to enjoy these beaches. There’s something so different about east coast beaches, I love them. I’m a west coast guy and so used to seeing the sunset, but watching the sunset the different direction is amazing or a sunrise. Being a surfing and planning my next east coast trip, I’m thinking Cisco Beach. Keep up the best beaches! I never made it to Massachusetts yet. I’ve been on the Florida beaches and myrtle beach but the further north I would say is probably much cooler. I would like to try these beaches if I ever made it that far north. Another thing that I was reading Manchester-By-The-Sea on Singing Beach was reserved for residents does that mean they would let you swim there? Massachusetts has some beautiful beaches, but yes it will be a bit cooler (which could be good as it is hot here in Florida right now), and the water as well. The beaches for residents only do not allow visitors sadly. So you will have to head to one of the public beaches 🙂 Thanks for visiting the best Massachusetts beaches. 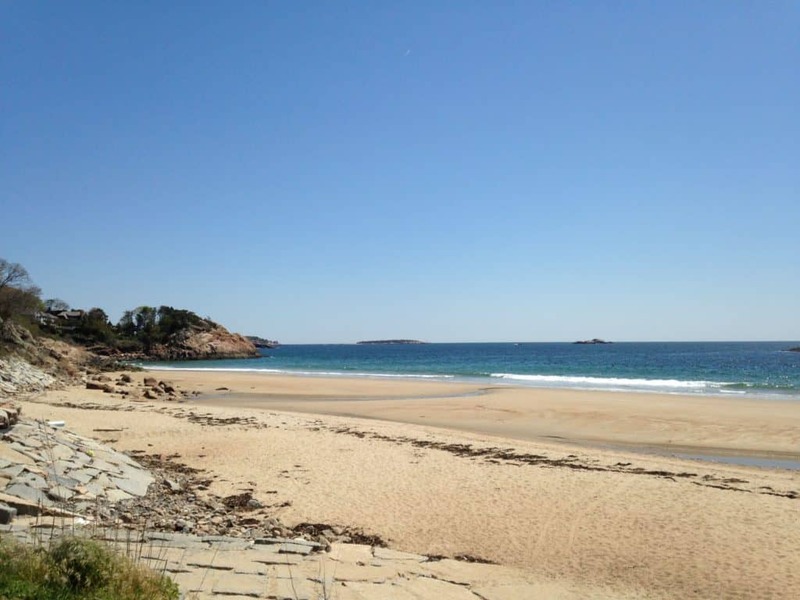 I was to Massachusetts years ago in my twenties, but I have never seen these beautiful beaches. What a shame:) But it’s never too late. My ante lives in New York, more precisely in Manhattan and I’ll soon be visiting her. It would be a great idea to go to Massachusetts at the same time. 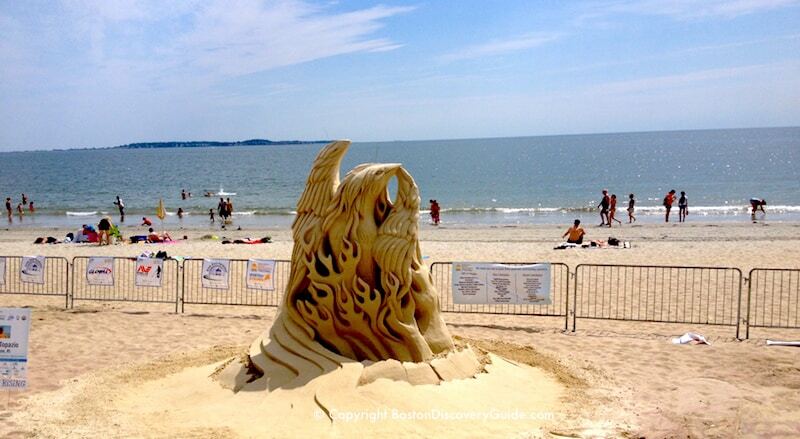 My husband loves to sculpt with sand, and I am sure he will enjoy the revere beach. 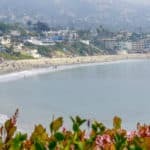 Since we don’t like crowds beach, is there a time of the year we should avoid? 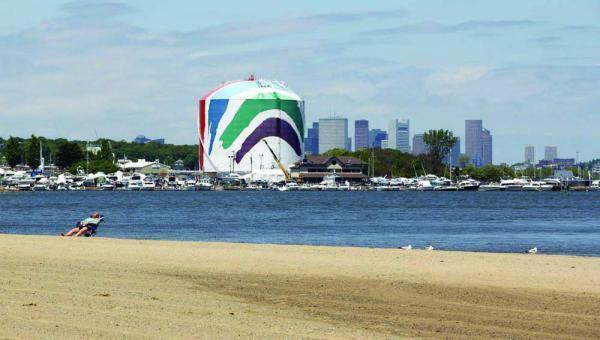 Hi Daniella, and thank you for visit the best Massachusetts beaches. If you want to avoid the crowds, definitely wait until the summer months are over. A great visit would be in September or October before the water gets too cold, yet the crowds will have died down considerably with the kids back in school. Hi Leahrae and thanks for this awesome posts about some beautiful beaches. As always you inspire me to get out and see them for myself! What is the water temperature around Massachusetts? Is it swimmable in the summer? I imagine it would be quite refreshing! Yes, it is definitely swimmable in the summer with an average temperature of 75! I have a pool and to me 88 feels like bath water, 75 is a lot more refreshing and you can actually cool down somewhat. Yes, I go several times a year to different beaches. This is my passion 🙂 Thank you for visiting! Hi, I never thought about the Massachusetts beaches as a holiday destination, but you quite changed my mind with this post. My favorite seems Madaket Beach from Nantucket, I’m sure it offers a unique and exceptional view. No, you will not normally find really hot weather, although it is humid and that does factor in. I lived in the desert for 10 years where our summer temps were in the triple digits everyday….usually around 115. Now I am in Dallas and the temps are a tad cooler (around 100). Hot is hot, but humid makes it feel somewhat warmer. Thank you for visiting! Going down south for the eastern shores the water gets progressively warmer for sure. I have attached a link where you can see this. As you start out up north, the temps are in the 50s and as you head toward Florida, they gain warmth and the temps are in the 80s. Here is the link: https://www.nodc.noaa.gov/dsdt/cwtg/all.html thank you for reading! This review that you wrote about beaches in Massachusetts especially hit home with me. I was born in Boston, Mass and lived in that state until I turned 5. Even after moving to Connecticut, quite often as a youngster my parents took a family trip, (along with my sister and the family dog) practically every summer camping in their trailer, (later RV motor home) in trips especially up to Cape Cod and Martha’s Vineyard. We were in Martha’s Vineyard having rented out a house, (for what was the only time) in late July/early Aug of 1969 right after Man landed on the moon and Senator Ted Kennedy had his incident in which a young female in the car with him died in Chappaquidick, MA. I especially remember that on Martha’s Vineyard our rented house was quite close to one of the beaches located there. The exact name of this beach I cannot remember from all of those years ago. Going up to Cape Cod my parents always had their favorite camping spot up in Wellfleet, MA. The campground was near enough to a beach where we could get on our bicycles and it took us about 5 minutes to get there. I think, but I’m not positive that the Cahoon Hollow beach area in Wellfleet might have been that particular beach that we visited. We spent a lot of time as a family playing on the beach before getting back on our bicycles to return to our trailer/motor home the short distance away. It was very nostalgic for me in reading this article, Leahrae. There was also another beach up in Cape Cod that I often visited while staying at in the town of Hyannis as an adult during vacation visits. The Kennedy family for decades had a massive summer home in that town, of course right near the beach. Hyannis is actually one of the larger beach towns up on the Cape, and as such during most of the summer can be quite touristy. 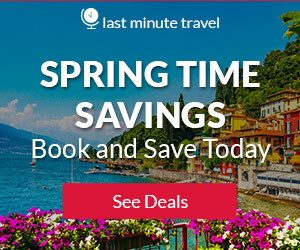 I found the best time to visit actually was in April or in the fall during the off-seasons. A very informative and well-written article, Leahrae! Thank you so much Jeff for reading and for your wonderful comments! I have not made it to Martha’s Vineyard yet, but I will 🙂 Especially after reading your comments. These beaches look spectacular! I have been wanting to see more of the northern coastline. I have a question. I live in FL so the weather is good almost year round for beach travel. When are the best months to visit the beach up north? Are there any times of the year I should avoid? Thanks! Yes, there is a bit of a difference in weather for sure. Best time is going to be from June thru September when you will find temperatures mostly in the 80s with some 90s and 100s. Its going to be a bit cooler in May and October. I know that I have been to the beach in St. Pete in October and it was wonderful. I don’t think you will find that farther north. Thanks for visiting!